MDaemon Email Server is a comprehensive messaging and collaboration solution providing secure, standards-compliant features for small-to-medium-sized businesses. It supports mailing lists, remote access and administration, spam-blocking, content filtering, mobile email, and multiple domain support. It uses all current email authentication techniques to minimize email fraud and security threats. The MDaemon Email Server delivers full email server functionality, installs in minutes, and requires minimal support and administration. MDaemon supports IMAP, SMTP, and POP3 protocols and delivers solid performance from its feature-rich and user-friendly design. Moving from one email server to another typically poses a significant challenge but MDaemon makes it simple. MDaemon's (Web-Based Email) is easy to use and offers all of the features needed by small-to-medium business customers. 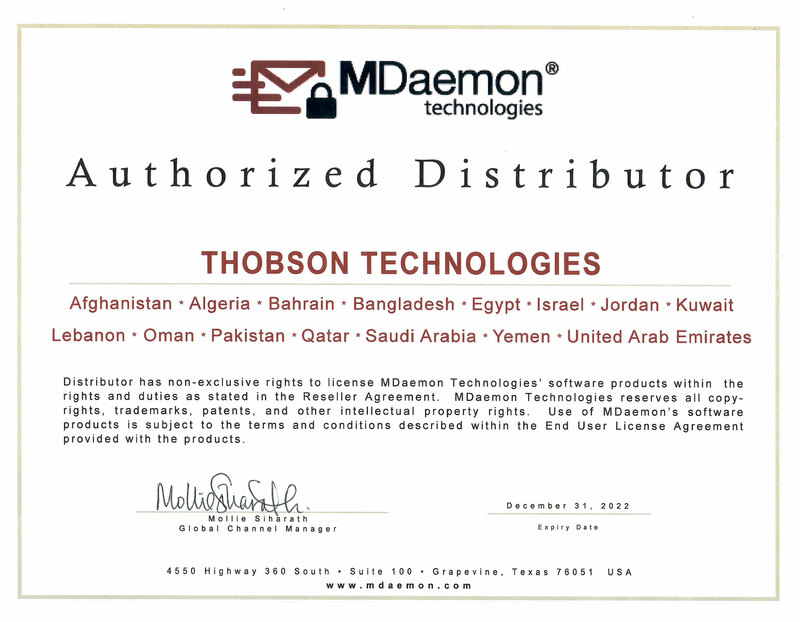 Thobson Technologies and its subsidiaries are Authorized MDaemon Partner for United States (US), Middle East - Arab Emirates (AE), Pakistan (PK), Bangladesh (BD), Afghanistan (AF), Algeria (DZ), Bahrain (BH), Egypt (EG), Israel (IL), Jordan (JO), Kuwait (KW), Lebanon (LB), Oman (OM), Qatar (QA), Saudi Arabia (SA) and Yemen (YE). We are only accepting orders form these countries, please contact MDaemon Technlogies to find out a partner in your area. The MDaemon Email Server is trusted by customers in over 90 countries around the world to meet the needs of their small- to medium-sized businesses. MDaemon is a reliable and secure mail server that does not require expensive administration or impose high per-user costs. It simplifies messaging and collaboration requirements with an intuitive, user-friendly design offering enterprise-class features that can be managed with minimal training and support. Mobile Device Management to implement password policies or wipe devices when lost or stolen . Customizable Mail List Engine to manage bulletins, discussion groups and distribution lists. Access to world class knowledgeable staff. Multiple language MDaemon (Web-Based Email) with integrated Business Instant Messaging. Flexible Content Filter for customized server behavior of incoming and outgoing messages. Backscatter Protection prevents the receipt of unwanted messages due to a forged email return path. http://www.blackberry.com/btsc/microsites/search.do?cmd=displayKC&docType=kc&externalId=KB15139 From the MDaemon console: Click on the Accounts menu Click Edit Account. Double Click on the account you wish to BES activate Select BlackBerry Enterprise Server on the left paneCheck the box labeled Enable BlackBerry device synchronizationSelect 'OK' Now that the account is BlackBerry BES enabled, we can activate the device. Log in to WorldClient using Microsoft Internet Explorer 6 or later.Click Options Click BlackBerry Management If you receive an Internet Explorer - Security Warning regarding RIMWebComponents.cab, click Install Note: When accessed for the first time, the BlackBerry Management screen will need to download and use an ActiveX tool. You may need to add your WorldClient URL to Internet Explorer's Trusted Sites list.Plug in your BlackBerry device into your computer using a USB cable. Note: When plugged in for the first time, it will install the drivers for the BlackBerry device. This will require Administrative rights.Input your BlackBerry device password if prompted Once installed, it will show the BlackBerry device model and PIN number. Click Activate Device When the wired activation is complete, you will see the following message: Wired activation complete. You may disconnect the USB cable. Enterprise activation will continue on the device. You can then disconnect your device from the computer. A new email icon will appear (Desktop) on your device representing your BES enabled MDaemon account and Enterprise Activation will continue in the background. Additional Comments This feature is only available in MDaemon Pro. Related Articles KBA-02284 How do I activate a BlackBerry Smartphone Over the Air (OTA) with a BlackBerry Enterprise Server (BES) enabled MDaemon account? KBA-02387 How do I activate a BlackBerry Smartphone using a USB cable through WorldClient with a BlackBerry Enterprise Server (BES) enabled MDaemon account? Whenever the MDaemon server is running, its icon will be visible in the system tray. However, apart from simply letting you know whether or not the server is running, the icon is also dynamic and will change colors based upon the current server status. The following is a list of the icon indicators:White - All okay. No mail in local or remote queues.Blue - All okay. Mail in local or remote queues.Yellow - Available disk space below threshold. See Disk tab on Miscellaneous Options.Red - Network is down, dialup failed, or disk is full.Green - This is the system tray icon for a MDaemon Configuration session.Icon Blinking - A newer version of MDaemon is available. Additional Comments When accessing the MDaemon server via Terminal Service or Remote Desktop you may not be able to see the actual MDaemon server icon. You will need to start an MDaemon Configuration session to access the GUI (Go to the programs menu and just run 'Start MDaemon' again).